If you are short on money but still visiting the modern furniture shops then we can just say that you are barking up the wrong tree! 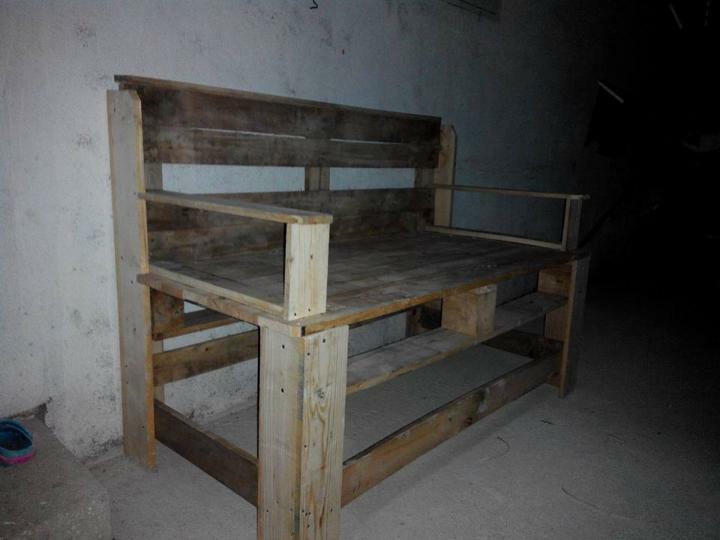 If you are really serious about your furniture issues then pallet furniture are just best of both worlds! To complaint against the modern prices is just like you are crying over split milk! Pallet wood is only the true way to accomplish all your furniture desires and is also costing you a very little at the same time which is equal to nothing! 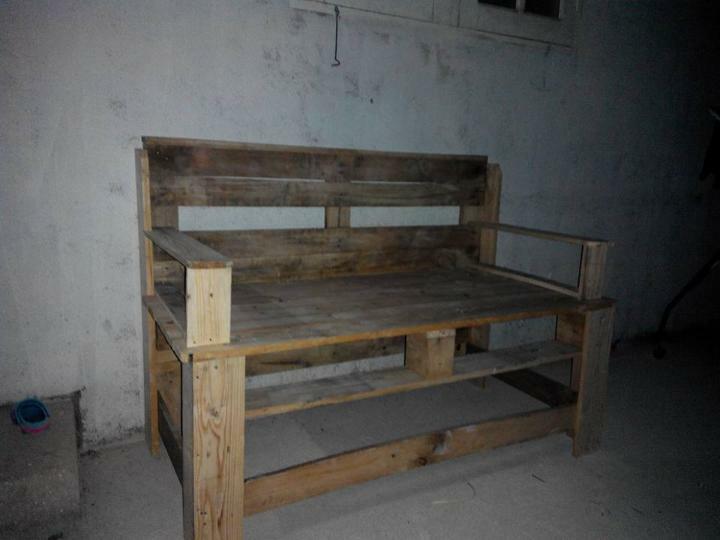 This DIY wood pallet bench is a sample of amazingly feasible nature of pallets, go for a few readjustments in original structure of pallet boards and get this heavy duty bench at your hand! Absence of benches in your park and garden areas can lead you to an unpleasant situations, this is very right plan here to a get sitting-friendly benches for your outdoor places otherwise the market-bought benches can cause a heavier load on your wallet! 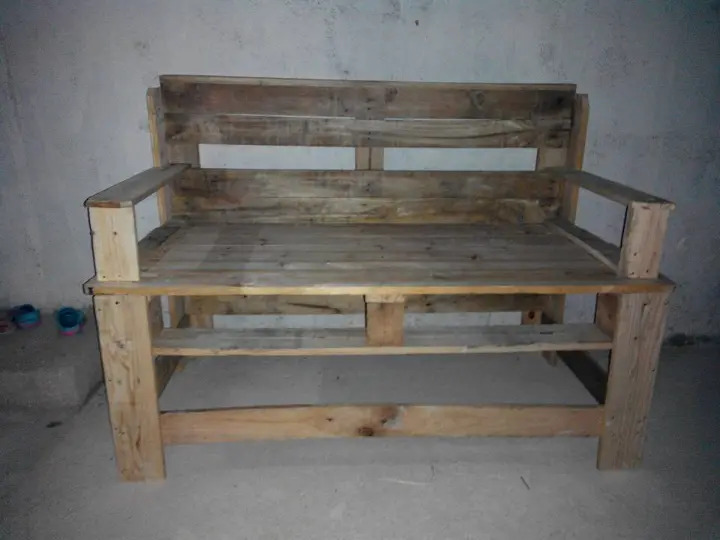 Pallet wood can just play a big supporting role for an enhanced look of your home or garden space as they this highly stable bench design can be added to either to your garden or a cozy home entryway or porch area! Divide the pallet boards into separate dice sections and deck board sections and plan the parts of whole bench structure which would just be a piece of cake to do! You can see that a whole pallet length gives a berth while a dice-less sections gives the dominating backrest position! Angular legs have been built by give L-shape attachments to 2 pulled apart pallet boards cut down to specific length size! Further support has provided by making the cross beam wooden attachments! Armrest just make the design exceptional and visually arresting and also enhance the comfort value of the bench!